I’m sure that you’ve all come across the multiple names that the same quilt block may have. How did that happen? It seems that as quilt blocks were exchanged among early quilters, the quilters were likely to change the block name to one that seemed more appropriate to themselves. In addition they may have altered the block a bit to more reflect their personal tastes. This bluework quilt is made up of embroidered and pieced blocks. The pattern notes that the pieced block is known by the following names: Monkey Wrench, Hole in the Barn Door, Churn Dash, Love Knott, Lincoln’s Platform, and Sherman’s March. Monkey Wrench – this block is said to have alerted slaves to gather tools that they might need on their journey north to freedom. Churn Dash – refers to the churn dasher used to turn milk into butter. This block has been in continuous use in South Carolina for more than 150 years. No not really. Mother Nature is just really confused this winter. One day it will be in the 50’s and the next we will be lucky to hit 20-30 degrees. As I was out checking the bird feeders this morning I actually spotted two robins. There arrival is normally the first sign of spring in Central New York. We don’t see them this time of year since they usually feed on worms. Apparently some do winter over feeding on the berries, fruits and seeds that they find on shrubs, trees and vines. These two were taking advantage of the snow melt to feed on their preferred food. Unfortunately they flew away before I could take a picture! – However, I was able to get one of a woodpecker who is a frequent visitor this time of year. Making progress on my guild’s UFO challenge. I’ve completed three simple quilts. Seems like cheating but thought it would give me the incentive to tackle the more involved ones. Over the Moon I made this quilt 2 years ago at Patchwork Plus in a class taught by Perry Kentner using Linda Warren’s Learning Curve ruler. The only thing that was needed was the hand sewing of the binding. Dogwood Candle Mat I fell in love with this woolwork pattern while on my annual quilters retreat at the Watson Homestead 2 years ago because of the two-dimensional applique. The only thing that was left to be done was the homespun backing. Falling Leaves Table Runner The foundation for this table runner was completed at the same Watson retreat but I still needed to complete the applique. The kit had fabric that was to be used to complete pumpkin applique. Since the colors of autumn leaves are my favorite I decided to use the laser cut leaves instead. Quilting and binding were the only other things needed to complete the quilt. Now on to the 3 quilts that will take a bit more time. 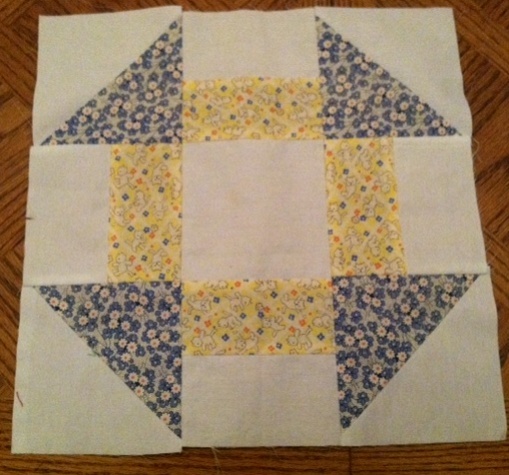 Currently I’m working on piecing a group quilt as well as a wallhanging that is appliqued and embroidered. I normally like to have hand work and machine work available to me at the same time. I never know what I am going to work on at any particular time. Also it means that when I am traveling it’s easy to pick up something to take with me and work on it in the car. To all my friends and family who have become snowbirds or have moved permanently south I’m sending you a reminder of home. Winter has been good to us so far (keeping my fingers crossed). We did have a major snowfall the weekend before Thanksgiving – 25 inches in 2 days. Luckily the snow began on Sunday and was over by Monday evening so most people were home and able to stay off the roads. Roads were clear on Tuesday so we could easily get on with life. In many parts of the country this would be catastrophic – not in Upstate NY where it’s just another day! I was talking with a friend in North Carolina Monday evening and she was sure that we would be snowed in for a couple of days. If nothing else we can handle it here without blink of an eye. Winter Sounds was published in a current issue of AARP Bulletin. Admit it – it did at least bring a smile to your face! Well it’s January 1 – the traditional time for resolutions! Here are two of mine – Let’s see how well I do. 1 – Add new posts at least 2- 3 times a week. 2 – Par down some of those UFO’s that seem to be multiplying in my storeroom. I have to admit that I have some help getting started with this. Our guild program chair has initiated a challenge that inspired me to organize my UFO stash. She is challenging us to go through our unfinished projects and decide those that we want to complete this year. As an extra benefit there will be a monthly drawing and a bonus end-0f-challenge drawing when the projects are finished. This project certainly should keep me busy this year. Wish me luck!